Q: What does bioavailable mean and why is high bioavailability important when selecting vitamins? A: Vitamins can come in different forms, some of which are easier for the human body to use for its biological functions than others. The higher a vitamin’s bioavailability, the easier it is for your body to absorb. For example, there are two common forms of vitamin B6 (pyridoxine and pyridoxal-5-phosphate). The latter has a higher bioavailability than the former, which is why we use it in Primal Master Formula. Most other brands, however, use the less absorbable form in an effort to cut cost, since the more bioavailable form is more expensive. But our philosophy is: why include a vitamin if your body is just going to eliminate most of it due to low bioavailability? With Primal Master Formula, you get more bang for your buck with every highly useable ingredient. Q: Do I have to take the full dose to achieve benefits? A: We kept studies from clinical nutrition in mind when formulating the dosage for each ingredient in Primal Master Formula, but everyone’s body is different. We don’t recommend taking any more than the recommended dose, but people have certainly taken less than the recommended dose and found that it works for them. This is why customizing your autoship schedule (the rate at which your supplements ship to you) can be so convenient! Q: Are the values on the Nutritional Label the Gross or Net amount? A: All of the amounts on the Supplement Facts labels are Net. For Example, there are 400mg of Net Elemental Magnesium. Q: What are phytonutrients and nutraceuticals? A: Phytonutrients and nutraceuticals are substances found in plant and food sources, many of which have been extensively studied for their health benefits. For example, Primal Master Formula contains lycopene (a substance found in tomatoes), which has been shown to support eye and skin health. But vitamins aren’t the only nutrient lacking in the modern diet. 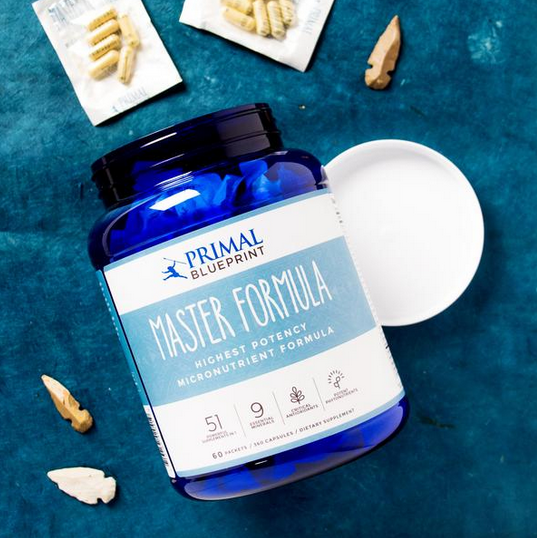 So when creating Primal Master Formula, we procured some of the most well-studied varieties of phytonutrients and nutraceuticals, and provide them at optimal doses. Q: How should I take Primal Master Formula? A: Many of the vitamins in Primal Master Formula are fat soluble, so it’s best to take the capsules with a meal. The serving size is two packets per day, but as mentioned before, you can take the amount that works best for you! Q: Why did you change the Folic Acid in the Master Formula to Folate? A: Folic acid refers to the oxidized synthetic compound used in dietary supplements and food fortification, whereas Folate refers to the various tetrahydrofolate derivatives naturally found in vegetables and "whole-food" based products. Folate is the natural form of the compound. It is a water-soluble vitamin B-9, which is more bio-available for the body. Q: How long until I feel the benefits? A: This will vary on each individual. Q: My Master Formula seems to be a darker color than usual, and there are dark specks in the capsules, are these okay? Q: I have a specific health concern. Can I take Primal Master Formula? A: As with any vitamin supplement, always consult your doctor before trying new nutritional products. Q: What is the Vitamin C derived from? A: The Vitamin C is synthetic and Not derived from corn or any other grain.